Are there major differences between small interfering RNA (siRNA) and micro RNA (miRNA)? Learn where they overlap and how they function. 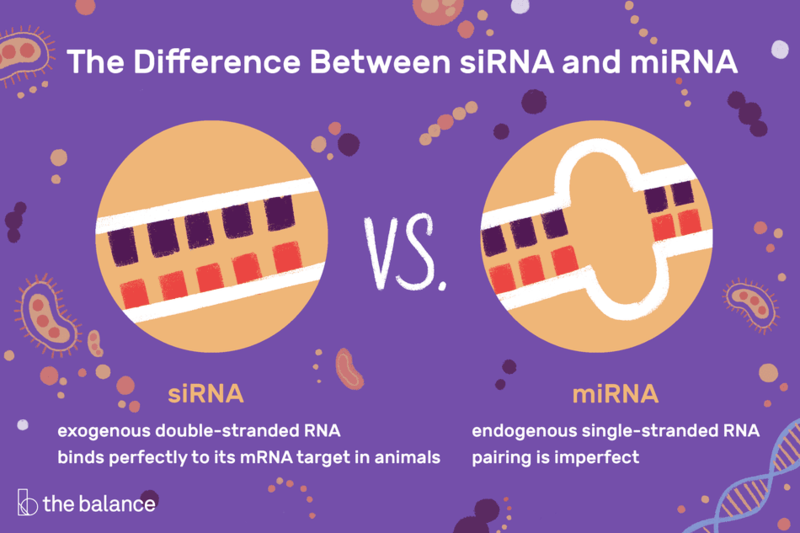 Before you can understand the ways in which siRNA and miRNA are similar and how they're different, it helps to know just what they are. Both siRNA and miRNA are proteomics tools used to study various aspects of gene expression. Proteomics is the study of proteins by which a cell's complete complement of proteins is examined at once. Technological advances have made such study possible. So are siRNA and miRNA similar or different? The jury is still somewhat out on that question, depending on whom you ask. Some sources feel that siRNA and miRNA are the same things, while others indicate that they're separate entities entirely. The disagreement comes about because the two are both formed in the same manner. They emerge from longer RNA precursors. They're also both processed in the cytoplasm by an enzyme called Dicer before becoming part of the protein complex RISC. Enzymes are proteins that can improve the rate of reaction between biomolecules. The process of RNA interference (RNAi) can be moderated by either siRNA or miRNA, and there are subtle differences between the two. As mentioned, both are processed inside the cell by the enzyme Dicer and incorporated into the complex RISC. siRNA is considered exogenous double-stranded RNA that is taken up by cells. In other words, it enters through vectors, such as viruses. Vectors arise when geneticists use bits of DNA to clone a gene to produce a genetically modified organism (GMO). The DNA used in this process is called a vector. Although siRNA is thought to be exogenous double-stranded RNA, miRNA is single-stranded. It comes from endogenous noncoding RNA, meaning that it's made inside the cell. This RNA is found within the introns of larger RNA molecules. Another difference between siRNA and miRNA is that siRNA typically binds perfectly to its mRNA target in animals. It's a perfect match to the sequence. In contrast, miRNA can inhibit translation of many different mRNA sequences because its pairing is imperfect. Translation occurs after messenger RNA is altered and binds to a particular site on a ribosome. In plants, miRNA tends to have a more perfectly complementary sequence, which induces mRNA cleavage as opposed to just repression of translation. siRNA and miRNA can both play a role in epigenetics through a process called RNA-induced transcriptional silencing (RITS). Epigenetics is the study of heritable genetic information in which the nucleotide sequence of DNA is not altered but manifested as chemical marks. These marks are added to DNA or chromatin proteins after replication. Likewise, both are important targets for therapeutic use because of the roles they play in the controlling gene expression. Gene Expression: What are Transcription Factors? What Are GMOs and Why Do Opponents Say They're Dangerous? What Is the Role of Contract Research Organizations in Big Pharma? What Is a Biobetter and Its Role?